The magazine style programme will feature all of the Classic TT Races from the two race days including the Bennetts 500cc Race, the Okells 350 and the Motorsport Merchandise Formula 1 and Formula 2 Races. The team will interview the teams and riders as well as getting the stories behind some of the iconic machines that will be appearing. The presenters will also visit the VMCC's Festival of Jurby as well as featuring the displays and parades including the Classic Racer Lap of Honour and the Joey Dunlop Road Racing Legend - the Rivals parade lap sponsored by The Isle of Man Steam Packet Company. Away from the racing, a number of motorcycling legends and former World Champions are scheduled to appear in the Classic Racer Classic TT 'Lap of Honour' and Joey Dunlop Rivals lap which will also feature in the TV programme. 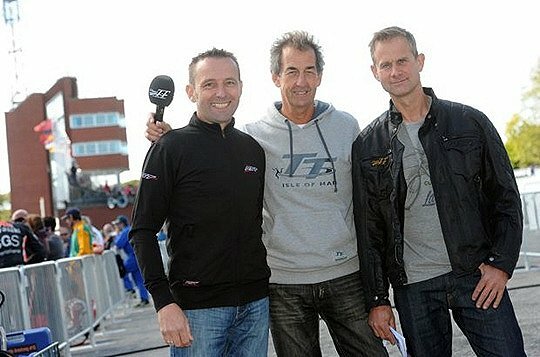 Topping the bill will be four time World Superbike champion Carl Fogarty, F1 World Championship winner Graeme Crosby and ex-GP Racer Rob McElnea.